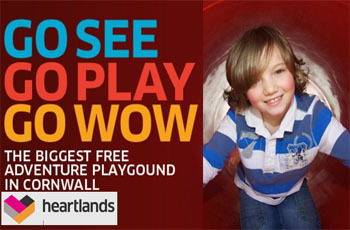 Cornwall’s first free cultural playground on a grand scale. 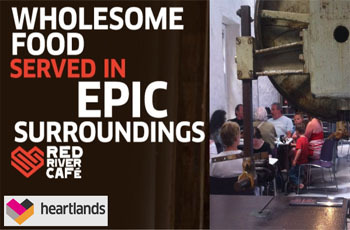 And don't forget to visit the Red River Cafe which offers delicious food and a friendly smile in this atmospheric and cosy café based in the old Carpenter’s Workshop at Heartlands. More about Red River Cafe. Open every day of the year (except Christmas and Boxing Day) this family attraction in Cornwall has a diverse menu of events, with something for everyone, so why not visit today and see what’s going on. 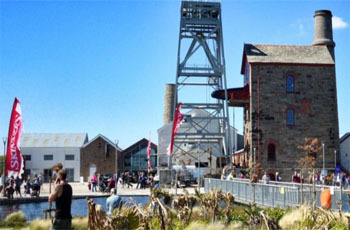 Set in the shadow of an iconic Cornish engine house, Heartlands has brought the former derelict mining landscape at Robinson’s Shaft back to life through extensive renovation and hard work. The result is a free attraction in Cornwall which really does have something for everybody (including dogs who are allowed to enjoy the facilities at this dog friendly attraction in Cornwall too). So, whether its breathing in the peace and serenity found in the Diaspora Botanical Gardens, shouting with glee after escaping the Giant's Trap in the Adventure Playground, or being taken back to another time through an immersion scape in the World Heritage Exhibitions, Heartlands has something to suit every age and interest. 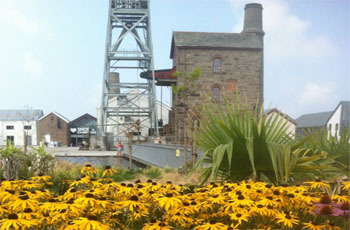 You can even get married at Heartlands, read about Cornwall Weddings at Heartlands. On top of the 19 acres of eclectic fun to explore, Heartlands fills up its year-round events programme with an exciting mix of farmers markets, cultural festivals, dance shows, music events, art exhibitions and theatre. Visit their website and take a look at their events pages to find out more or just pop in and see what's on - it'll cost you nothing and you can have a cup of tea or a chat with their friendly team while you decide what to do! Fresh delicious food and a friendly smile is as complicated as it gets at this atmospheric and cosy café based in the old Carpenter’s Workshop at Heartlands. The Red River Cafe chef, Tim Treseder, sources local Cornish produce where possible to cook up an ever-changing menu with daily specials to satisfy every palate. There’s a relaxed servery during the day and table service for special evening openings. Everything is cooked here, on the day, at Heartlands – Look out for their delicious daily specials made on demand and delivered to your table with a smile! If you just feel like a cup of coffee or tea and a cake that's great too. 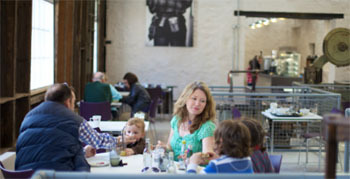 The Red River Cafe is part of the Truly Cornish Cafe Trail - If you love Cornwall, Choose Cornish – it’s that simple! The Red River Cafe is a dog friendly cafe in Cornwall and allows dogs on leads into the cafe (although please keep them away from the food serving counter). There are also regular art displays at the Red River Cafe with a featured artists. The Red River Cafe takes pride in their ability to cater for anyone who has a special dietary need, so please mention any special dietary requirements to a member of the team and they will be more than happy to assist you. A variety of gluten free cakes are on offer and they are happy to make up gluten free filled rolls on request and will endeavor to meet any dietary need where possible. The Red River Cafe say they do their best to accommodate all their customer’s needs, including the provision on request of cups with larger handles, packs of condiments and cutlery.